I love a good market. There’s honestly not much I enjoy more in this life than wandering past rows and rows of stalls, browsing the various treasures on display and sampling all the yummy food. I’ve visited a ton of good ones at home and abroad, but I reckon the Eumundi Markets in Queensland, Australia, are next level. Held twice weekly on Wednesday and Saturdays, these artisan markets are well worth planning your holiday around. Mrs Man vs World and I scheduled our Sunshine Coast road trip so that we’d pass through Eumundi on our way from Mooloolaba to Noosa Heads, and we didn’t regret it. They’re located roughly 20km west of Noosa and approximate 41km from Mooloolaba. It was a pleasant enough drive through the countryside. When we arrived, finding a place to park the car proved a wee bit tricky. There is parking on site, which costs about $5 or more, but we like to travel on the cheap, so we eventually managed to find a free spot on the side of the road, about a 10-minute walk away. That was on a Wednesday. Imagine how busy these markets must be on the weekend! 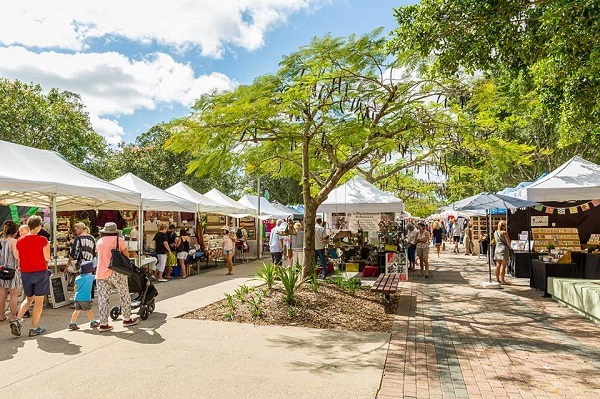 But even if parking can be a hassle, it’s well worth the effort, because the Eumundi Markets boast more than 200 stalls. There was heaps of art, crafts, furniture, toys, books, and more nick-nacks and collectibles than I could possibly list here. We spent a lot of time in a poster store on the outskirts of the market, where we purchased some vintage travel posters to adorn the walls of our house back home in New Zealand. The price was good and the range was outstanding. 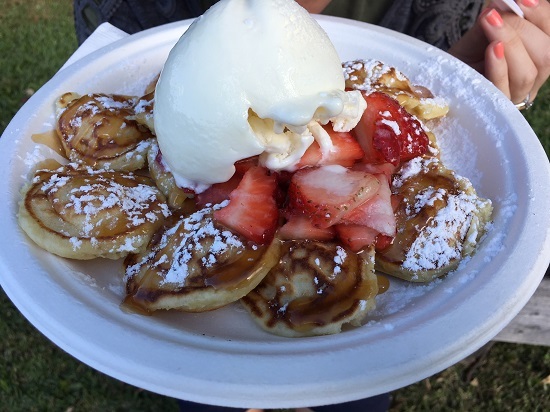 Just as impressive was the plate of mini pancakes we feasted on, drizzled in caramel sauce, and covered with strawberries and ice cream (pic, above). We didn’t have lunch at the Eumundi Markets, but there were heaps of awesome options. Instead, we ate pizza and chips at the Imperial Hotel across the road. 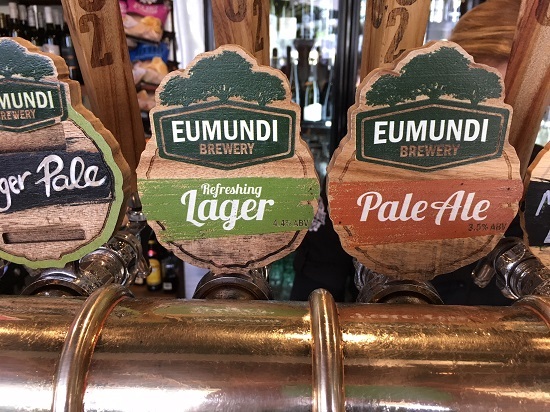 You might not know but I’m also a craft beer blogger, and this quaint-looking hotel is home to the Eumundi Brewery. I definitely recommend dropping in for a brew once you’ve shopped up a storm at the Eumundi Markets. The markets are happening every Wednesday in Eumundi from 8am-1.30pm, and every Saturday from 7am-2pm. **Note: The Eumundi Markets are sometimes known as “The Original Eumundi Markets”, I assume to distinguish itself from the imposter markets over the road. Just between you and me, I think all the markets in Eumundi are good, so visit them all if your legs don’t get too tired.